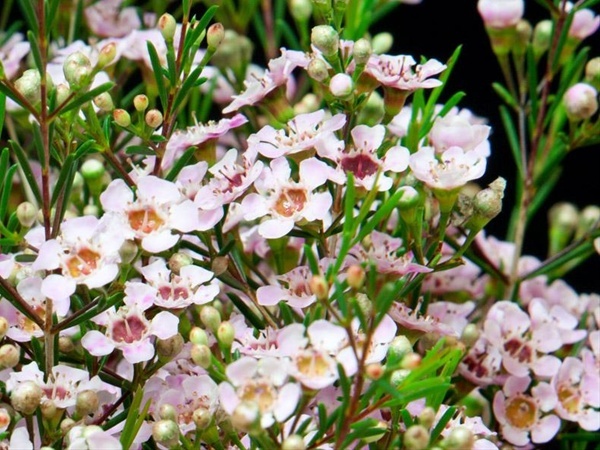 Many new, longer lasting varieties of waxflower are introduced each year. New "megapetalum" hybrid varieties are much longer lasting (up to 2 weeks) and tight buds will actually open in water. 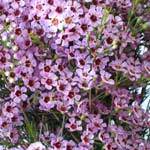 For longer vase life purchase only waxflower which have been STS treated. Most Waxflower varieties are classified by growers as Early, Mid-Season or Late in the key growing areas. This means for the Southern Hemisphere ( i.e. Australia) Early- June// July Mid Season - August / September Late - October / November / December. 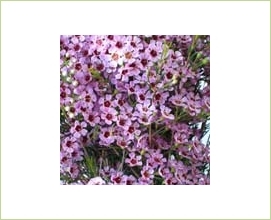 California Waxflower comes packed in 8/10/12 bunches per quarter box and 18/20/25 bunches per half box. Larger packs are not advised. Peru Season runs from May through to October. Peruvian Wax tends to be non-variety specific - it is usually offered by color. The quality of the varieties is good and consistent. Peruvian Wax is favoured as a generally lower price point wax, partly in due to Peru's close proximity to the North American marketplace. Waxflower should be hydrated using floral preservative. Water should be changed regularly. Graded by stem length and weight. 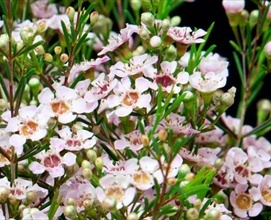 Australian waxflower bunches are usually 350- 400grams and California bunches are usually 500 + grams. Minimum stem length is usually 50cm and can often be available up to 70cm although some late season varieties may only reach 45cm but are still very useful for design work. Should be shipped with at least 75% open blooms. Very early season wax can be shipped with 50% open blooms. Fixed stem count Bouquet Grades are also available. Waxflower is ethylene and botrytis sensitive and must be STS treated to avoid bloom shattering. Newer varieties with better vase life and structure demonstrate better market demand. Should not be shipped with "bearding" or "bypass" growth above the flower blooms but 5cm in late season is still acceptable. Most of the recent, improved Hybrid varieties are protected by law under the Plant Breeders Rights and cannot be grown without paying royalties. Newer, improved Waxflower varieties are commonly sold at a premium price over older traditional varieties.